The Theatre Program at the University of Illinois Springfield will hold open auditions and crew interviews for the first production of its 2012-2013 season – Molière’s Tartuffe - on Tues., Sept. 4 and Wed., Sept. 5. Crew interviews start at 6 p.m. and acting auditions start at 7 p.m. both nights in the Studio Theatre, located on level one of the Public Affairs Center at UIS. Call-backs will be at 7 p.m. on Thurs., Sept. 6. Auditions are open to students, staff, faculty, and community members with or without experience. Auditions will consist of “cold readings” from the script; prepared monologues are welcome, but not mandatory. Resumes are appreciated, but are not required. Scripts are available to anyone for 3-day check-out at the Brookens Library circulation/reserves desk. Those interested in working on a crew (running crew, costumes, props, stage management) will be asked to fill out a crew application form and meet briefly with the production staff. Moliere's 17th century comedy is brought to light in a contemporary translation by Ranjit Bolt. The play, subtitled, “The Hypocrite,” focuses on a religious fraud, Tartuffe, who slyly dupes a wealthy merchant, Orgon, into signing over his estate, and even his daughter, to Tartuffe. Orgon’s family readily recognizes Tartuffe’s unscrupulous behavior, and Orgon’s refusal to acknowledge Tartuffe’s fraud creates much of the comedy. Twice banned in the 17th century as sacrilegious, Moliere repeatedly petitioned Louis XIV, who finally allowed the play to be performed in 1669. 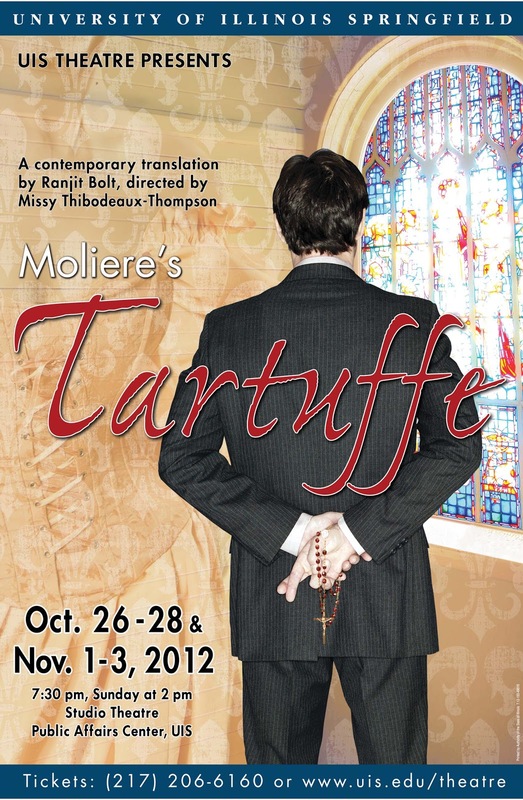 Tartuffe has continued to gain popularity and relevance ever since. UIS Associate Professor of Theatre Missy Thibodeaux-Thompson will direct. Production dates are Oct. 26-28 and Nov. 1-3, 2012. The curtain time for Thursday, Friday and Saturday night shows is 7:30 p.m. with the Sunday performance starting at 2 p.m. Ticket prices are $14 for adults, $12 for senior citizens (65 or older with a picture I.D. ), $10 for UIS Faculty/Staff and $8 for UIS students (and all other college-level students) with a valid, current i-card or college I.D. card. Please note that a service charge, not included in the prices above, from Sangamon Auditorium will be added to each ticket price, at the time of purchase. To avoid a higher service charge, buying tickets in person at the Sangamon Auditorium ticket office is highly recommended. For more information about auditions, the play, or helping behind the scenes, contact Missy Thibodeaux-Thompson at 217/206-8307 or mthom1@uis.edu. You may also visit the Theatre Program’s website at www.uis.edu/theatre.